California is now the most populous state in the entire USA (over 30 million) and if it were a separate country it would be the 7th largest country in the world in terms of economic power. From its southern border with Mexico thru the city of Santa Barbara (about 180 miles) is a continuous stream of hundreds of different cities and counties along the Pacific coastline which are in reality one huge continuous wealthy thriving metropolis. Although signs sometimes delineate where one city begins, the average visitor would be unable to tell one community from another. The area comprises beautiful unspoiled beaches, rugged coastal mountains (many of which are in excellent condition), huge national forests, portions of a major desert and other breathtaking scenery. The human development is no less spectacular and a person could easily spend an entire lifetime visiting its thousands of suburbs and cities. It is a development of such huge magnitude that it is unrivaled anywhere else on this globe. It is virtually impossible for anyone's mind to fully understand the details of the gargantuan size, complexity and workings of this area. I just learned that during the 17th century, California had the largest density and population of American indians on the whole continent of North America. The major attraction of this area is our beautiful year round WEATHER. I guess it was the same three hundred years ago. The major cities of Los Angeles, Long Beach and San Diego attracted many visitors during the 1890's and we have many spoons from that era. In addition the huge mobile population of this megapolis has produced many different varieties of spoons of a more modern nature. I hope to provide a little overview of this tremendous area in this exhibit. 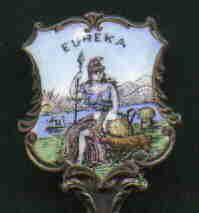 Eureka is a Spanish word meaning "I found it"
There are hundreds of different spoons from Los Angeles, but I have always preferred this one which has an angel blowing a trumpet proclaiming for all the wondrous merits of the city. For those of you who are not familiar with the city, the official name is "La Ciudad de la Reina de Los Angeles", which translates as the "The City of the Queen of the Angels". I know that you have seen countless news, television shows and films that tell you only about the problems of this huge metropolitan area, but I simply caution you NOT to believe everything that you hear, as the reality is very very different than the projected image. Located in Anaheim, California, Disneyland is one of the largest tourist draws in the world. I am sure that all of my readers are familiar with it, so there is no need to elaborate. Located in Hollywood, California, this very pretty Art Deco theater is themed with faux Chinese architecture. It is most famous for its courtyard where over the years various movie stars have preserved their hand and footprints in wet cement. Palm Springs is located in the Mojave desert in California. This very wealthy community has boasted the residence of many very famous movie stars, but especially Frank Sinatra. It is now a very fashionable place to play golf, and there are an incredible number of professional golf courses and fancy hotels available to visitors. The tramway goes from the desert floor to the top of the nearby San Jacinto Wilderness area mountains and features incredible vistas including the alpine forest. The most amazing thing is that the desert floor may have a temperature of 120+ degrees farenheit during the summer, while the temperature at the summit of the nearby mountain may be 70 degrees cooler. This very large and impressive dam is located about 40 miles east of Las Vegas and is on the Nevada and Arizona border (not in California). When you walk across the dam you actually cross the state line. The dam was built in the 1930's as a depression era project and was the largest dam of its time. The taming of the Colorado River created the huge Lake Mead which has become a big recreational area and it has prevented the periodic flooding of prime agricultural lands in Southern California. Electricity and water from this dam is used by Los Angeles, Phoenix, Tucson as well as Las Vegas in one of the largest and most successful irrigation systems in the world. but part of it has been redesigned as a movie theme park. William Randolph Hearst was a wealthy eccentric newspaper mogul around the turn of the century. He built this huge castle on a hill overlooking the Pacific Ocean midway between San Francisco and Los Angeles. The castle is decorated with thousands of magnificent antique works of art which Hearst purchased in Europe. The castle is now operated by the State of California and tours are available to the public. 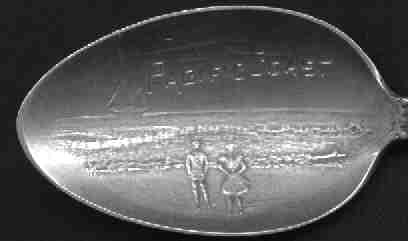 You can also see a spoon depicting Hearst's lover in the Movie Star exhibit. I think the left spoon is sterling, but it isn't marked. The right spoon is silverplated. Big Bear Lake is a small lake located in the San Bernardino Mountains southeast of Los Angeles. It is one of the few mountain lakes located near this huge metropolis and it is also near Palm Springs. Many private cabins and a small town are located in this heavily forested and heavily earthquake prone area. 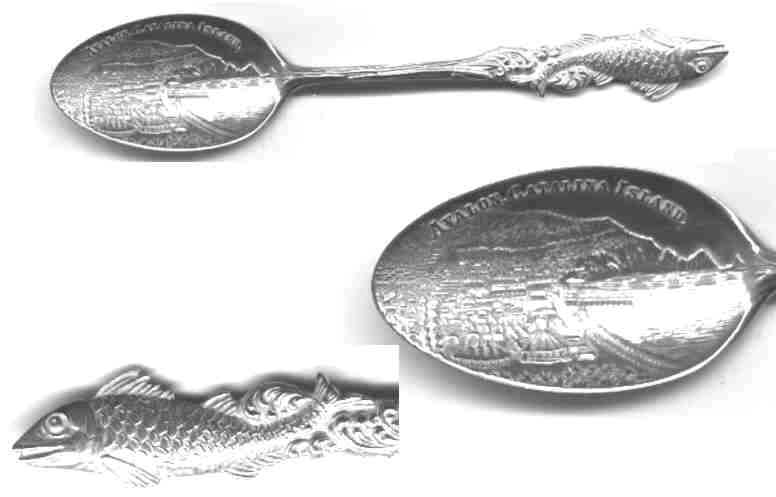 The left spoon is sterling but the right spoon is a full tea size spoon made of "solid copper". More bears--The bear is also the state animal. This spoon features two bears climbing a tree which is marked "California". Solvang is a cute Danish themed "tourist trap" town in the Santa Ynez valley about 20 miles north of Santa Barbara, California. 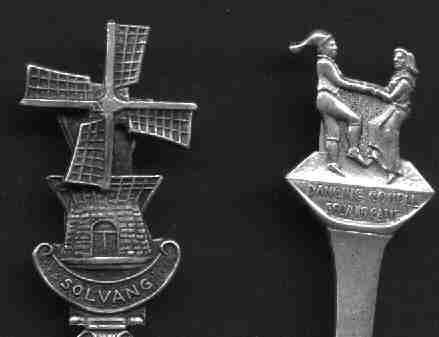 The two spoons on the left are silver plated. The windmill turns. Knotts Berry Farm and Ghost Town is an "old west" themed amusement park in Buena Park near Disneyland (about 30 miles south of Los Angeles). It features many thrill rides and frequently hosts concerts. Across the street from Knotts, there used to be an alligator farm where visitors could see thousands of the reptiles. As a child I remember visiting this farm and I even got to "sit" on one of the huge alligators. Death Valley, California is in the Mojave Desert and is the lowest spot in the USA . It is not unusual for summertime temperatures to soar past 120 degrees farenheit and except for spring (when the wild flowers bloom) it is not a pleasant place (This area is typically the hottest in the entire USA). When the covered wagons tried to cross the Mojave Desert on the way to the California coast, a number of them did not make it, thus the reason for the name. Muir Woods National Monument is located just north of San Francisco and is the site of some very large and ancient redwood trees. Some of these huge trees are reputed to be over 2000 years old and redwood trees are also the largest known tree specie. The area is named after the famous naturalist John Muir who convinced Teddy Roosevelt to help establish the national park system in this country. 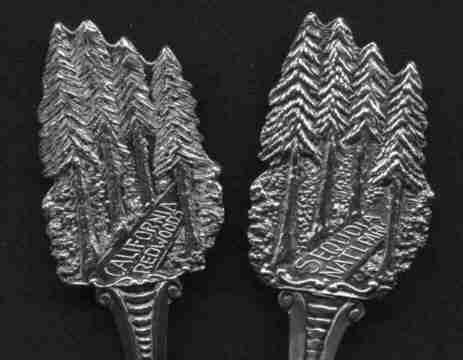 Two silver plated spoons with the same forest design. The left says "California Redwoods"
The right says "Sequoia Nat'l Park"
Cute Spoon labeled Los Angeles International Airport (LAX). Planes on silver spoons are a rare phenomenon. 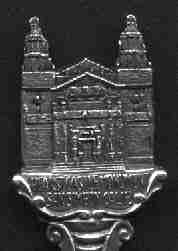 The commercial tourist trap that now exists in San Francisco, doesn't have the slightest resemblance to this 1920's era souvenir spoon. California is known around the world for the quality of its many beaches. Long Beach and Santa Monica Beach were very popular tourist attractions. Today they are simply large cities, but all ocean front beaches in California are public property and open to the public. Long Beach is a popular tourist attraction, and the Queen Mary and the Long Beach Pier and Exposition centers are still popular attractions. 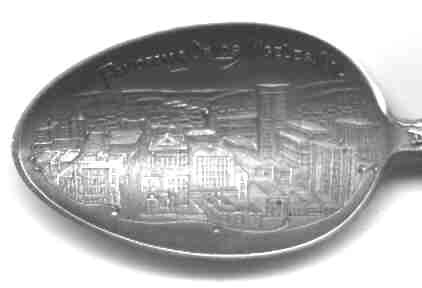 Generic embossed bowl identifying the "Pacific Ocean". It could be sold in any beach community. I thought that the style of dress was interesting. Finial figure of a Spanish Conquistador. 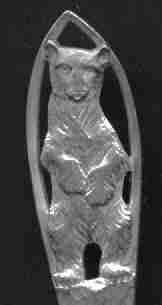 The bowl is engraved "San Bernardino" inside an arrowhead. The Spanish and Mexican powers were very important in California history. Los Angeles has a huge natural harbor which makes it an ideal shipping location for large ocean going ships. This harbor helped propel Los Angeles into a major metropolitan area. 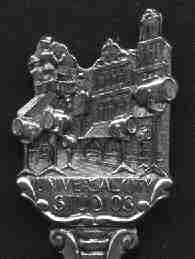 Lovely aesthetic style Wallace spoon acid etched "San Diego" in the bowl. The handle features sea shells, anemones, seaweed and the reverse features other sea plant life. 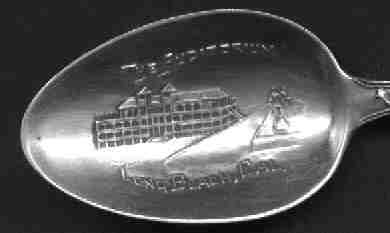 The back of the mussel shaped spoon bowl is engraved 1878-1891 thus this spoon probably represented some type of 13th anniversary. "26 miles across the sea..." from a very famous song "Santa Catalina is waiting for you and me". This rugged island about 26 miles from the port of Long Beach is one of the channel islands off the coast of California. It is the only island in the chain with any development (the others are all natural preserve areas and access is tightly regulated ). 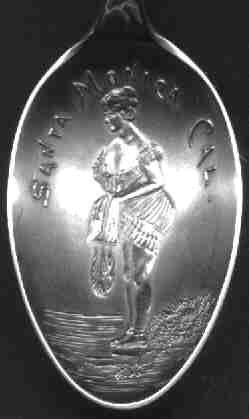 During the 1920's Catalina was a major destination for wealthy Angelinos and boasts a small port, casino, dance house etc. It was originally developed by William Wrigley (the chewing gum magnate), but is now owned by the state and there is a little amount of land in private hands. I have lived in the Los Angeles area for almost 50 years, and I have yet to visit this area. At this time it is not a major tourist attraction. The fish is known as a "flying fish". The fish jump out of the water and can fly for about 100 yards above the water. Sometimes they even land in the boat. Many more California spoons are shown in various exhibits in this museum. The orange exhibit and the palm tree exhibit also have many California spoons.